(Civil.Ge) — Head of the Georgian Orthodox Church, Patriarch Ilia II, said during a meeting with visiting EU official that the Church “will do everything” to help Georgia become EU member. “We are very pleased that Georgia, which has gone through a hard period of Communist regime, is today heading towards the European structures. The European Union is an organization, which is well known by the Georgian people. We will do everything for making Georgia a full-fledged member of this large organization,” Patriarch Ilia II said during a meeting with EU Commissioner for Enlargement and European Neighbourhood Policy Štefan Füle, which was also attended by several senior Orthodox clerics. “I want to say that incorrect information is disseminated in some countries as if the Georgian Church hinders this process. I want to assure you that the Georgian Church will do everything in order to realize this idea,” the Patriarch told the EU official. “There are such organizations, non-governmental organizations, which spread against the Church this notion [that the Church hinders European integration] and by doing so they perhaps are getting [financial] support,” Patriarch Ilia II said. “I’ve learned from the media that you said you would assure the Patriarch that Georgia can become the member with its traditions, values… I want to tell you that I am convinced in that for a long time already,” the head of the Georgian Orthodox Church told the European Commissioner. 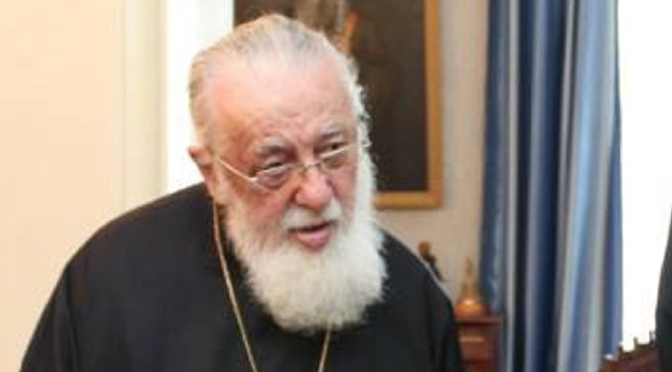 In his Christmas epistle, which drew controversy mainly because of its wording on the issue of surrogacy and artificial insemination, the Patriarch said that Georgia is part of “Christian Europe”, but the EU should take into consideration Georgia’s “traditions and mindset.” There are some high-ranking clerics, including within the Church’s main governing body Holy Synod, who have used anti-western rhetoric in their sermons before parishioners. In his public speech during a meeting with civil society representatives, before heading to the Georgian Patriarchate, European Commissioner Füle spoke on number of, as he put it, “myths and misperceptions” about the Association Agreement and mentioned among them a notion as if the EU threatens Georgia’s traditions. He said that adoption of an anti-discrimination legislation, which is one of the requirements under the visa liberalization action plan, “is not a way to impose an alternative lifestyle on anyone.” “What it does do is guarantee the right of individuals to fair and equal treatment regardless of their race, religion, gender, or sexual orientation,” he said. During his visit in Tbilisi on March 4, the European Commissioner also met President Giorgi Margvelashvili, PM Irakli Garibashvili, parliament speaker Davit Usupashvili, some other senior officials, as well as opposition representatives. One of the issues pushed by the Georgian officials was to speed up signing of the Association Agreement, which was initialled in November. EU leaders decided at a summit in Brussels in late December to speed up the process and to sign the Association Agreements with Georgia and Moldova “as soon as possible and no later than the end of August, 2014.” But Tbilisi, especially after the developments in Ukraine, seeks earlier date. According to the EU officials earlier date for signature is more of a technical rather than political issue. EU also seems to be pushing for using period before signing for a better public awareness about the Association Agreement. “We have an important job to do to inform citizens about this agreement. Without full information, it is natural that misunderstandings can appear,” Commissioner Füle said while speaking about “myths and misperceptions” about the Association Agreement. Another issue which the Georgian officials, in particular the Foreign Minister, raised was importance of giving membership perspective to Georgia. Commissioner Füle made reference to membership perspective in his public remarks in Tbilisi only after a slip up when he mentioned “signature of Lisbon” Treaty before correcting himself to say Association Agreement. “Why I mentioned the Lisbon Treaty?” Füle asked smiling at a news conference after meeting with PM Garibashvili. “I know why… Because of the article 49,” he added, referring to the article of the treaty, which constitutes the legal basis for accession. “We were talking about the light at the end of the tunnel,” Füle said, referring to membership perspective, and added that the Association Agreement should not be a “final station” for those who have European aspirations. The European Commissioner also said that he personally thinks spirit of the wording used by the EU foreign ministers in reference to Ukraine in February that the Association Agreement “does not constitute the final goal in EU-Ukraine cooperation” should also apply to Georgia and other partners with the European aspirations. During the visit the European Commissioner signed two financing agreements – one to support public finances reform in Georgia with assistance worth EUR 21 million and another one to strengthen the role and capacities of the Parliament with assistance worth of EUR 1.5 million. Commissioner Füle also announced that President of the European Commission José Manuel Barroso will visit Georgia in June. He also said that President Barroso invited PM Garibashvili and his government members to visit Brussels for a meeting with the European Commission – a setting, which, Füle said, the Commission normally has with governments of the EU-members states. He also stressed on importance of strong opposition, ensuring political pluralism and consolidation of democratic institutions.